The dog days of summer are upon us! I don’t know about you, but I loathe cooking in the Texas heat. I’m all about fixing fast meals that are hearty enough for lunch or dinner, and that the picky kiddos will eat. We eat a lot of sandwiches during the summer, and they get old fast. My kiddos love to mix it up a bit with wraps. I was so excited when I heard about the new flavors that Hidden Valley Ranch Dressing has. They had me at “Ranch Avocado”. I mean really— ranch — avocado. WIN WIN!!!! This was such a quick meal to whip up, and I know you will love the flavor, the lack of prep work, and not having to do a ton of dishes! This hearty wrap can be made with all your favorite fixin’s. These happen to be my favorite, but feel free to mix it up. I love to use shaved deli meat, fresh spinach, a ripe tomato, and crisp bacon. Topped with this dressing, it tastes like something from a gourmet sandwich shop! Make a batch in the morning and throw them in the picnic basket for an alfresco lunch. 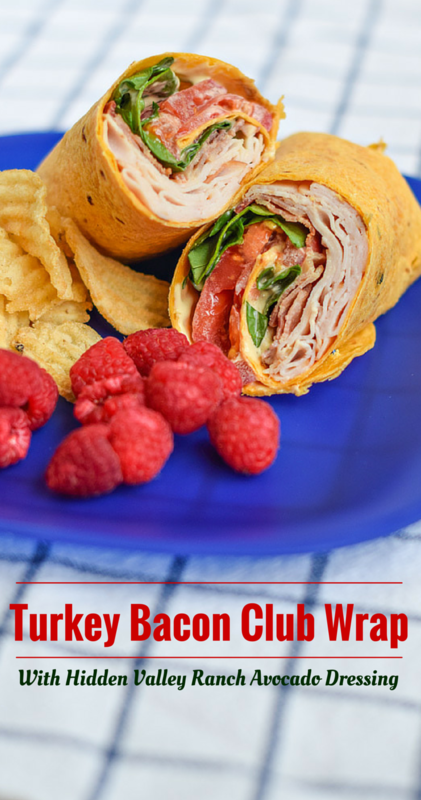 This Turkey Bacon Club Wrap is sure to become a new favorite. Along with the Hidden Valley Ranch Avocado Dressing. You’ll want to use it in the traditional ways or for jazzing up any sandwich. The other flavors are just as great! Craving that Turkey Bacon Club Wrap? Well, let’s get started! spinach (or lettuce, or kale) – Pick your favorite greens! 1. Lay the tortilla out flat. 2. Add a layer of turkey towards the bottom 1/3 of the wrap. Leave enough room on the edges to fold over. 3. Add a layer of bacon on top of the turkey. 4. Add a generous portion of spinach on top of the bacon. 5. Top the spinach with sliced tomatoes. 6. Drizzle the Hidden Valley Ranch Avocado dressing all over the ingredients. 7. Roll up in a burrito style fashion. Cut in half on an angle using a serrated knife. Secure with toothpicks if necessary. 8. Serve with an extra side of Hidden Valley Ranch Avocado Dressing for dipping! I was able to find these new flavors from Hidden Valley Ranch at my local Kroger store. They are located on the salad dressing aisle, where you would find the traditional Hidden Valley Ranch bottles. To help you out, I’ll show you the new products packaging! I also grabbed some other flavors. I’m looking forward to trying the Sweet Chili flavor inside some spring rolls! We ran into the Kroger store right after swim practice since it is next door to the pool (SCORE!). We had dinner made in a flash! Have you tried the new Hidden Valley Ranch Avocado Dressing? What do you use it on? If you like this recipe, and are looking for more, you can find them HERE. Be sure to stop by Hidden Valley’s “What’s Your Ranch” Social Hub too! You can also follow them on Pinterest, Facebook , YouTube , Twitter, and of course their own website. Hope you enjoyed this quick and easy twist on a classic sandwich. Let me know what you think!